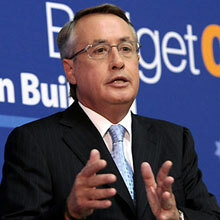 Wayne Swan, the federal treasurer, has handed down his second budget. It includes a record breaking deficit, massive infrastructure spending & huge revenue losses. An economic survey suggest that Australia may be a grumpier place in 2009. However, not as grumpy as Britain or the USA. In response to the global credit crisis Australian Prime Minister Kevin Rudd has announced the government will take unprecedented moves to protect Australia's economy. Australia's central bank has today boosted official interest rates by 25 basis points to 7.25 per cent, the highest level in over 12 years, to combat a sharp rise in inflation.